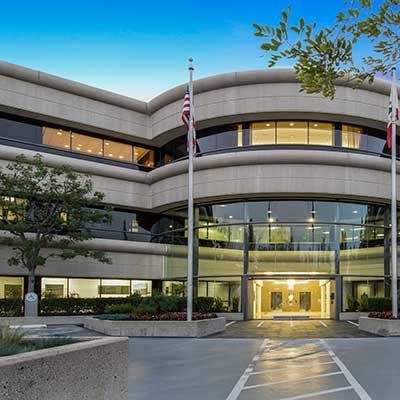 Burbank Corporate Center at 21900 Burbank Blvd., is a 91,109 square-foot, Class “A” former BOMA building of the year. The property offers immediate access to and exceptional visibility from the 101 Ventura Freeway. The three-story asset is situated on 2.15 landscaped acres and features a two-story granite and glass lobby, 24/hour access control and 284 parking spaces of surface and underground parking. There are myriad retail and dining amenities within walking distance including Westfield Topanga Plaza and The Village. High-end finishes abound in the building from coffered ceilings with indirect lighting, to solid wood crown molding and muted tones that are featured throughout the building. An outdoor patio with covered seating wraps around the back of Burbank Corporate Center, and offers tenants a respite during the day. With over 17.5 million square feet of commercial space, the Warner Center submarket serves as the CBD of the San Fernando Valley and the communities to the north (Santa Clarita Valley, Lancaster and Palmdale) and to the west (Ventura County). It encompasses approximately 2,000 acres of master-planned office, retail and contemporary lifestyle residential, and enjoys one of the most favorable jobs-to-housing balances in Los Angeles.